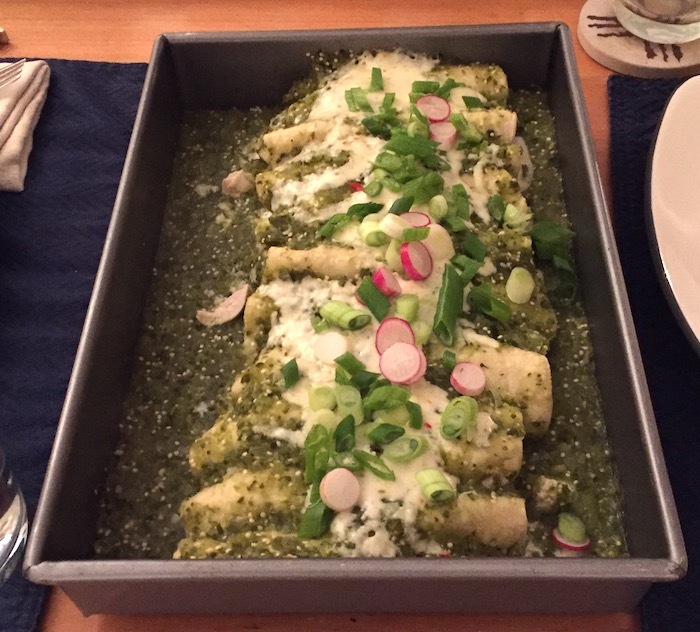 I enjoy enchiladas verdes: the bite of the tomatillos, the yummy cheese, the unexpected radish garnish… It’s a medley of delicious flavors. It’s a weekend dish, though, not something to make on a weekday unless you really, really like cooking. Set oven to broil setting. Heat 2t oil in saucepan over med heat, once shimmering, sauté onion for 6-8 minutes. Add 2t garlic & cumin, cook until fragrant, about 30 seconds. Stir in broth, add chicken. Cover and simmer 15-20 minutes (chicken should be 160F). Transfer chicken to plate to cool, remove 0.25c liquid, reserve remaining liquid for a different purpose (it makes a delicious soup base if you’re looking for something to save it for). Meanwhile, toss poblanos and tomatillos with 2t of oil, arrange on foil-lined baking sheet with poblanos skin side up. Broil 5-10 minutes, until veggies soften and begin to blacken. Cool, remove skins from poblanos, and transfer poblanos and tomatillos to food processor. Decrease oven temp to 350F and discard foil from baking sheet. Add 1t sugar, 1t salt, 1t garlic, reserved 0.25c liquid to food processor, process until sauce is slightly chunky, about eight 1-second pulses. Taste, add additional sugar and salt to taste. 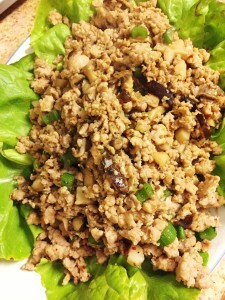 Pull or cut cooled chicken into small bite-sized pieces. Combine chicken with cilantro & 1.5c cheese (you should have another 0.5c of cheese to sprinkle on top). Smear bottom of 9″x13″ pan with 0.75c of tomatillo sauce. Place tortillas on baking sheet, spray with cooking oil, bake for 2-4 minutes, until soft & pliable. After removing them, increase oven to 450F. Place tortillas on countertop, and spread 0.33c filling down center of each tortilla. Roll tightly and place in pan, seam side down. Pour remaining tomatillo sauce on top, using spoon to spread to make sure it fully coats all tortillas. Sprinkle with remaining 0.5c cheese and cover pan with foil. Bake 15-20 minutes, until cheese is melted and enchiladas are cooked through. Uncover, sprinkle with scallions & thinly sliced radishes. Serve immediately. The light in my kitchen is weird. 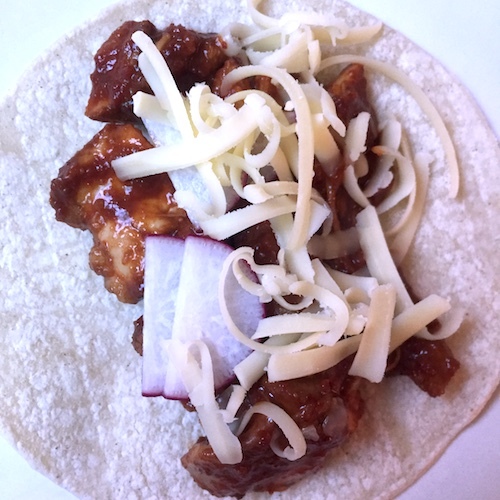 Yes, these are chicken tacos made with a sauce that is orange juice based. Yes, they are delicious. We tend to make them on the weekend because they take just enough time to be annoying after a long day of work. Heat chilies in large skilled over medium-high heat, pressing with spatula and flipping halfway through cooking until fragrant. Transfer to blender, add orange juice. Let stand for ~10 minutes, until softened. Add garlic, vinegar, coriander, honey, oregano, and salt. Puree until smooth. Pour back into skillet and bring to a boil. Nestle chicken thighs into sauce, cover and cook over medium-low, flipping halfway through, for 20 minutes. Set chicken on a plate; once cool shred into bite sized pieces. Meanwhile, simmer the sauce over medium-high, stirring, until reduced to 1 cup, about 10 minutes. Stir chicken into sauce. 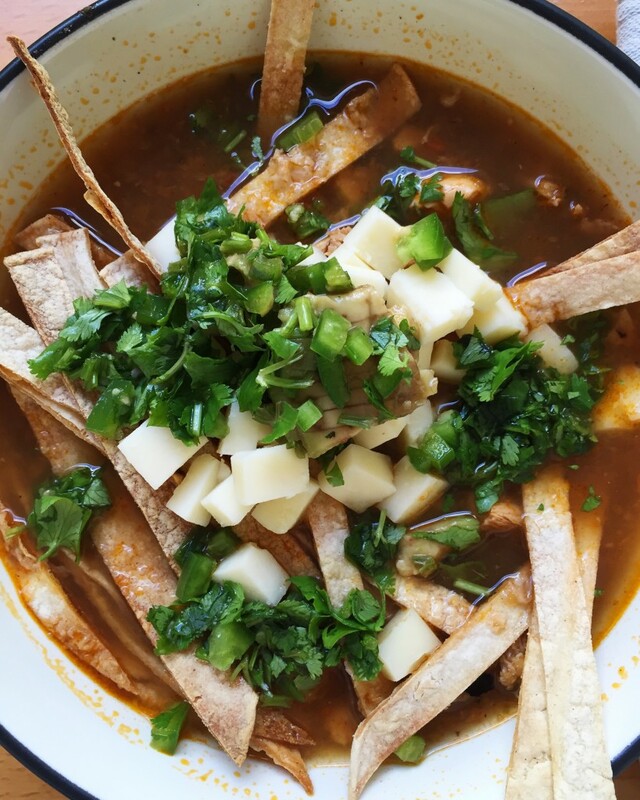 Serve with tortillas, radishes, and quest fresco (though we usually just use Monterey Jack). Once again, this is a Milk Street recipe. If you don’t subscribe, why not? You’re missing out on all kinds of deliciousness. They’re not even paying me to say that, I just like them. Because I am a working parent, quick dinners are a must. I’m a big fan of making a big pot of soup on the weekends and storing it in individual sized containers. I’m also a big fan of stir-fries and pastas. This drunken noodle recipe is a bit of a hybrid. 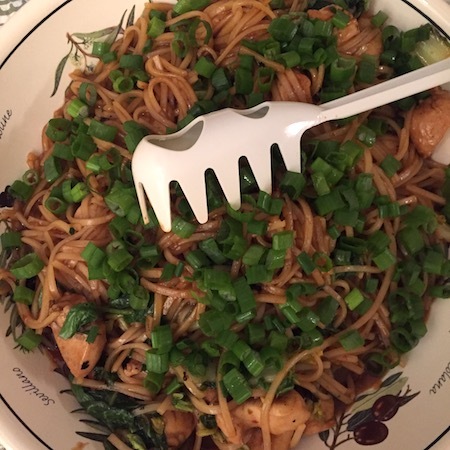 It’s an asian-style stir fry that uses rice noodles. Like any stir-fry, it requires some chopping, but it cooks quickly. It’s probably 45-ish minutes from pulling out the recipe to setting the serving dish on the table. Cover noodles in very hot tap water. Leave until pliable (~35 minutes, which, if you do this first and then chop the chicken & veggies, is conveniently about how long until you’ll need them again). Slice chicken breasts into strips 0.25″ thick. Toss with 1T tamari sauce. Whisk together remaining tamari/soy sauce, sugar, lime juice, water, chili-garlic sauce. Set aside. Heat 2T oil in 12″ nonstick skillet over high heat. Add chicken and cook for ~3 minutes. The strips should be nearly cooked through. Transfer to clean bowl. Add 1T oil to skillet. Add cabbage and cook until spotty brown, about 3 minutes. Transfer to bowl with chicken. Wipe out skillet, add 3T oil, heat over medium-high heat. Add drained rice noodles and tamari mixture, tossing gently until sauce has thickened and noodles are tender. (This typically takes ~5 minutes, but the recipe claims it could take as long as 10. That’s never been my experience.) Add chicken-cabbage mixture and cilantro. Cook until chicken is warmed through. 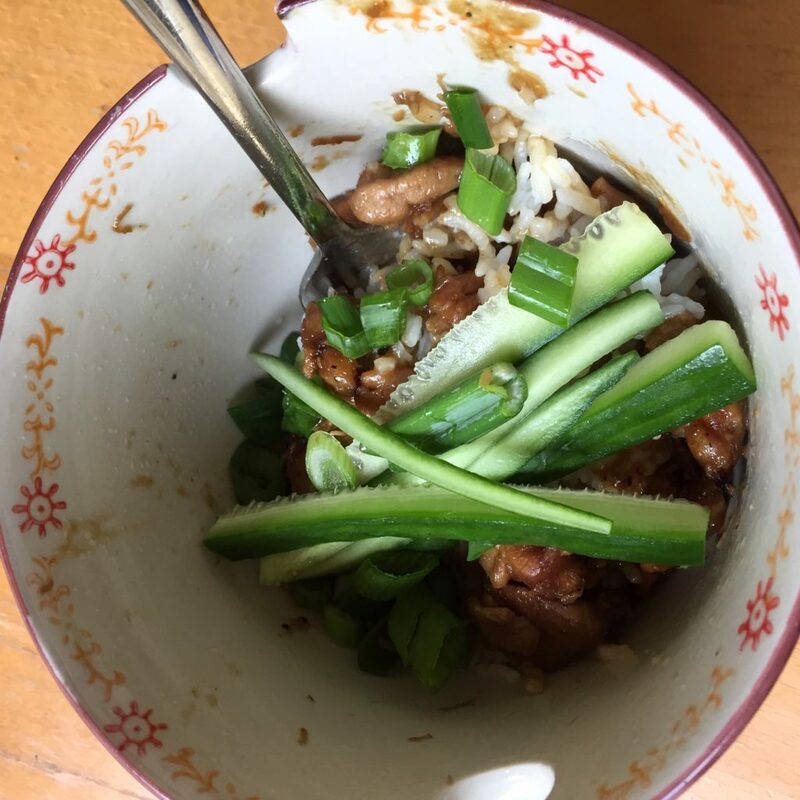 Sprinkle scallions & serve. Enchiladas are so messy. How can anyone make them look good? Regardless of what they look like, they are delicious. This is another weekend recipe, albeit one that makes enough leftovers that they can easily stretch to another meal. Especially when you serve them with a scoop of refried beans. Heat oil & sauté onion. Add garlic, chili powder, coriander, cumin, salt, and sugar; cook, stirring constantly, until fragrant. Add chicken, stirring constantly, until coated with spices. Add tomato sauce & 0.75c water. Stir to separate chicken slices. Bring to simmer, cook for 8 minutes. Pour mixture through strainer into medium bowl. Transfer chicken to plate to cool. 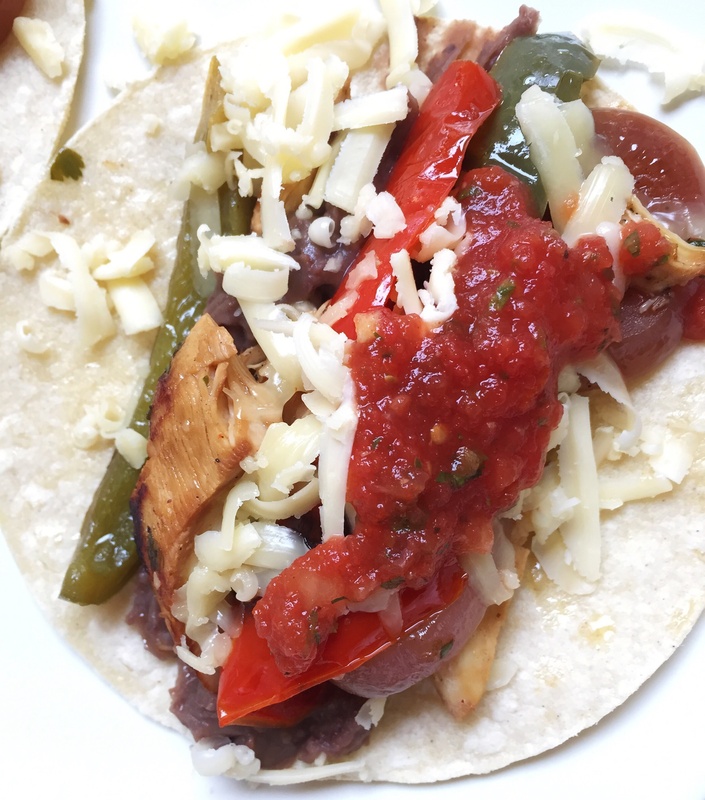 Combine chicken with cilantro, jalapeños, and cheese in medium bowl. Heat oven to 300F. Heat tortillas for about 4 minutes. Once tortillas are heated, increase oven temp to 400F. Smear bottom of 9×13 pan with 0.75c chili sauce. Fill each tortilla with 1/3c filling. Roll each tortilla tightly, place in baking dish, seam-side down. Pour remaining sauce over enchiladas. Sprinkle an additional 3oz cheese over top. Cover pan with aluminum foiled, bake for 20 minutes. Uncover & serve immediately, passing lettuce, sour cream, avocado, and lime wedges separately. In truth, this weekend was all about celery. I had some in the fridge, and it was wilting. I made tuna salad and potato-leek-fennel soup (which also uses celery) and this lovely little stir fry from Cook’s Illustrated known as Chinese Chicken Wraps. The kid, of course, still eats around the vegetables, but she does eat it. 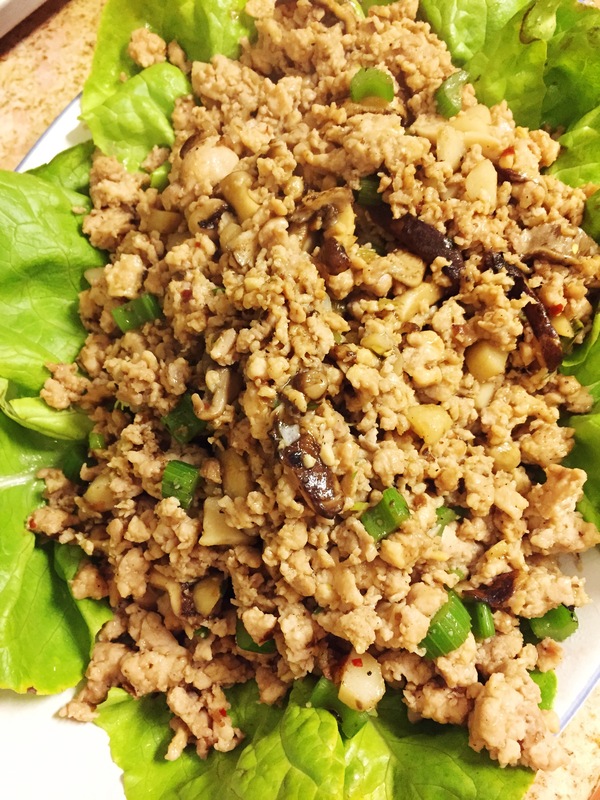 It’s intended to be an appetizer (if you spoon the filling into each lettuce leaf, rather than pile it all on top like I did), but add some rice and it’s a robust meal. Place chicken on large plate, freeze until edges are getting hard. About 20 minutes. Mix all other ingredients in medium bowl. Pulse meat in food processor for 10-1 sec pulses. Transfer meat to medium bowl with sauce. Let rest for 15 minutes. Whisk all ingredients together. Set aside. Heat 1T oil in 12″ non-stick skillet over high heat till smoking. Cook chicken. Move to separate bowl. Wipe out skillet. Heat remaining 1T oil (high heat, till smoking). Add celery & mushrooms; cook, stirring constantly, until mushrooms are about half the size, 3-4 minutes. Add water chestnuts, scallion whites, and garlic. Cook till fragrant, about 1 minute. Whisk sauce to recombine. Add chicken to skillet, then add sauce. Stir to combine. Serve over lettuce leaves. I forgot to take the photo until about halfway through dinner. Ooops. Oh, enchiladas verdes. How do I love thee? Let me count the ways…. Your recipe also involves a green salsa recipe, which I have made without the enchiladas. It is also delicious. Cheeeeeeeese. Melty, cheesey, chicken-y deliciousness. Heat broiler. Heat 2t oil in saucepan, sauté onions till golden. Add 2t garlic, cumin, cook till fragrant. Add chicken & stock, cover, simmer 15 minutes, flipping halfway through. 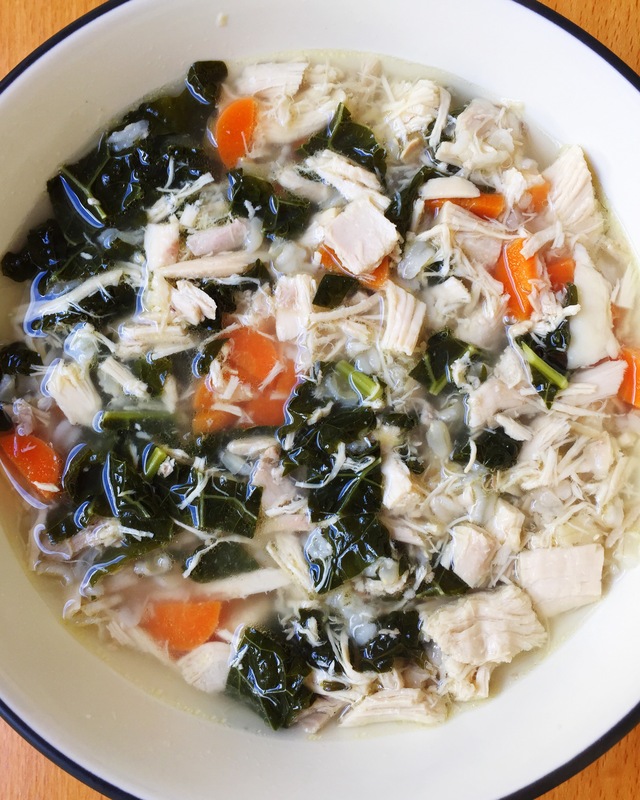 Remove chicken from broth and let cool. Remove 1/4c liquid, discard the remainder. Toss tomatillos and chiles with 2t oil. Place on baking sheet, broil until vegetables blacken and soften, ~5 min. Let cool, then remove skin from chiles. Transfer vegetables to food processor. Decrease oven temp to 350. Add sugar, salt, pepper, and reserved cooking liquid to food processor. Process until sauce is slightly chunky. Taste, seasoning with additional salt, sugar, and pepper to taste. Dice chicken. Combine with cilantro and all but 1/2c cheese. 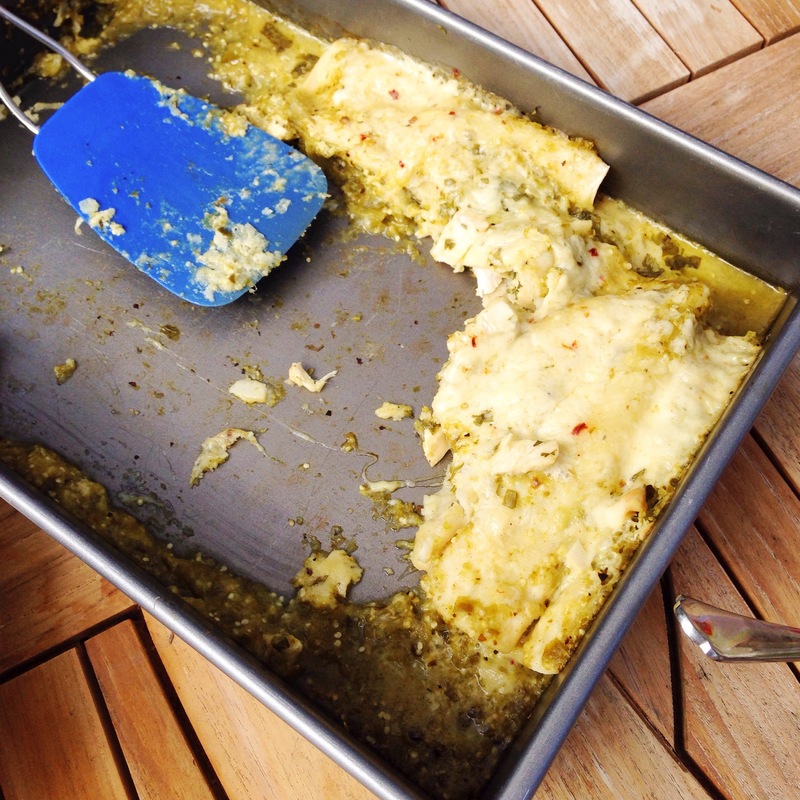 Smear bottom of 13″x9″ pan with 3/4c tomatillo sauce. Heat tortillas in oven for 2-3 minutes, until pliable. Increase oven temp to 450. Spread 1/3c of chicken filling mixture down center of each tortilla. Roll each tortilla tightly, place in pan seam side down. Pour remaining sauce over enchiladas, using spoon to spread it evenly over all of them. Sprinkle remaining 1/2c cheese down middle. Cover pan with foil. 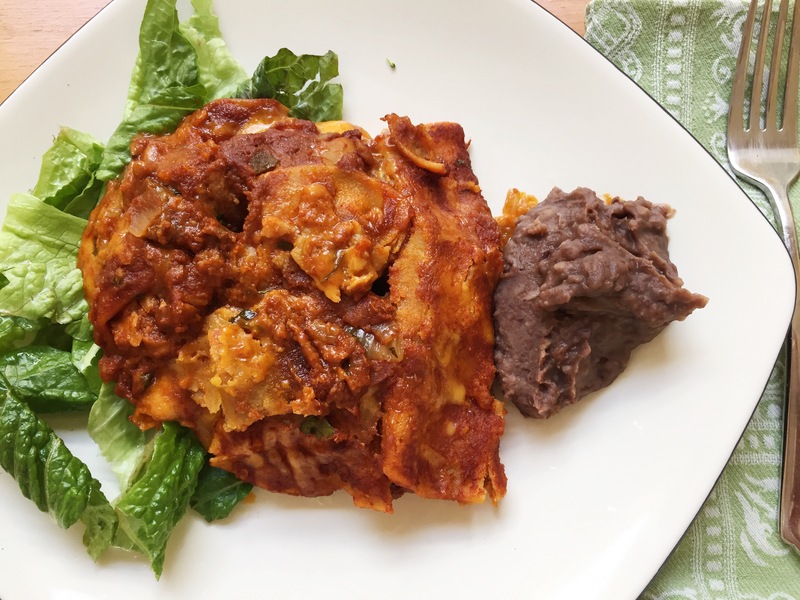 Bake enchiladas for 15 minutes, until cheese is melted. Serve immediately.